When it comes to seafood, very few things can compare to eating plump fresh diver scallops. Perfectly prepared, they need nothing more than a simple sprinkle of salt and pepper to bring out their subtle salty, sweet flavor. To get that crispy sear on the outside and barely cooked pearly white texture on the inside is not as difficult as it seems. First you need to start with very fresh scallops. 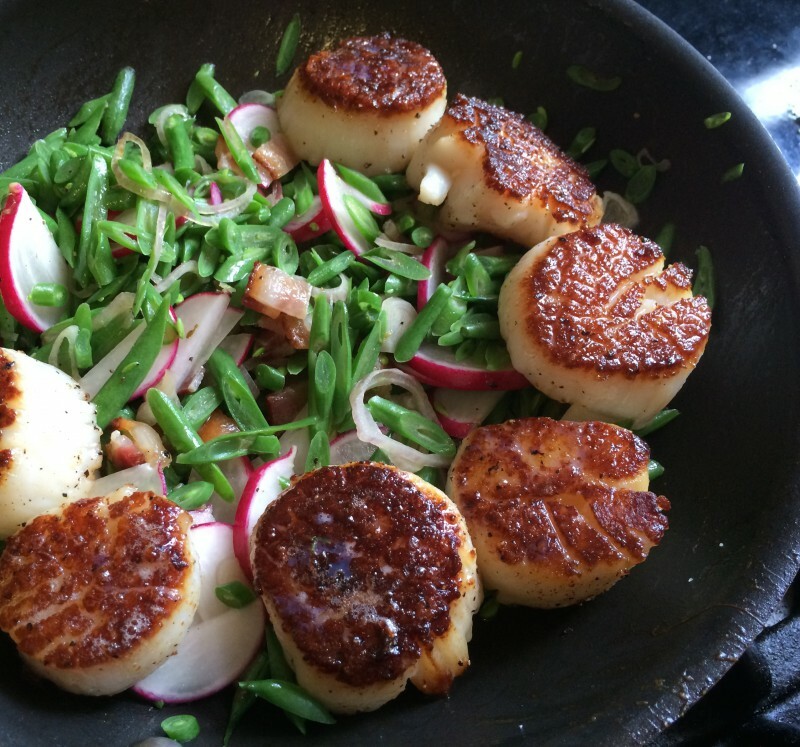 Scallops treated with preservatives retain water and will never give you a good sear. Look for dry (untreated) scallops that are firm, and have little to no odor. To prepare them, use a heavy oven-proof saute pan. Cast iron, with its non-stick seasoning and heat retaining properties works perfectly. Heat a few tablespoons of vegetable oil in the pan over high heat. Carefully place the scallops one by one into the hot pan, leaving at least a 1 inch gap between them. Crowding the pan will cause the scallops to release too much water, making them steam instead of sear. So, for large scallops, put no more than 3 scallops in a 8″ pan, and no more than 6 in a 10″ pan. Then leave them alone until they turn golden brown on one side. If they are bigger than 1 oz. each, you may need to give them some oven time. So after you get one side golden brown and crispy, transfer the pan into the lower half of a 400 degree oven until the tops of the scallops just begin to turn opaque white around the edges. Pull the pan out of the oven, flip the scallops over, and melt a pat of butter in the pan. It is important not to overcook scallops or they become rubbery and unpalatable. Just let the heat of the pan carry them through as you baste them with the hot butter and aromatics of your choice – a sprig of thyme, some sliced garlic, a bay leaf, or sliced shallots are always good complements. Now you should have scallops that are crisp and salty on one side and velvety, sweet and tender on the inside. Having some sliced shallots, freshly cut haricot verts, thinly sliced radishes and already cooked bacon on hand made it easy to whip up a quick warm salad while the scallops were in the oven. We melted some butter and reserved bacon fat in a saute pan and gently sauteed the shallots. Haricot verts went in next with just a splash of water to steam them and cook them through without losing the bright green color and snap of the beans. Finally we tossed the warm beans with peppery radishes, salty smoky bacon, and tart lemon-y chopped sorrel. Keeping with simple clean flavors in the salad let the scallops steal the show. Tags: Bacon, Fish, Green Beans, Ideas, Low Carb, Radishes, Scallops, Seafood, Slow Food, Sorrel. Bookmark the permalink. looks delicious. I never think to cook with scallops. Will have to try this.